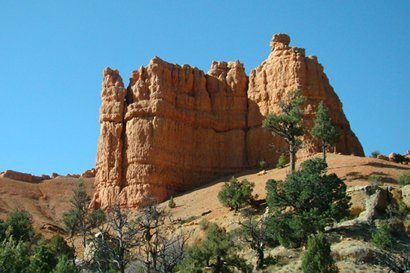 Utah’s Scenic Byway 12 - Hogback Road, Bryce Canyon, Red Canyon, Utah Hotels. 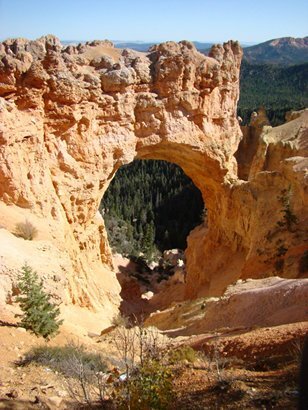 We became aware of the Escalante when we saw it at a distance from Bryce Canyon a few years ago. 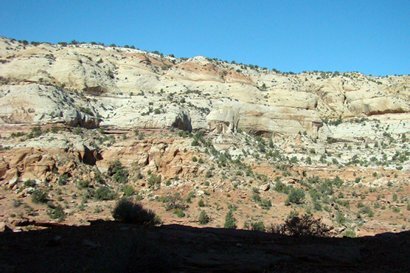 Also known as The Grand Staircase, it is a geological formation of colored cliffs, plateaus, mesas, buttes, pinnacles and canyons. I used a street atlas program to help select our route. 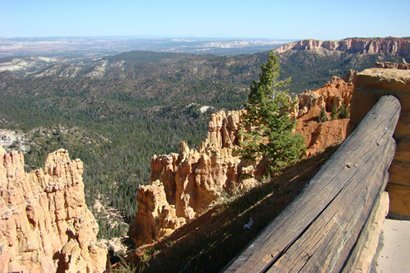 My chosen via points are the reasons we came to use State Road 12 between Torrey and Bryce Canyon. 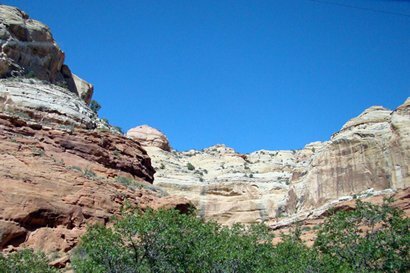 Utah’s Scenic Byway 12 has been voted one of America’s ten most scenic highways. 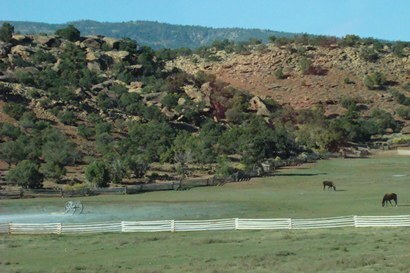 Our trip starts at Torrey on Hwy 24 in Utah’s northern high land of the Dixie National Forest. That means we travel on the tilted terraces stepping down forming great cliffs. The map says first we ascend to 9600 feet elevation on this road. 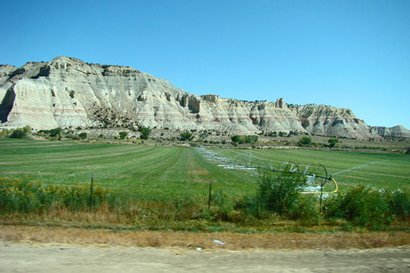 As we travel south we can see Boulder Mountain looming to our southwest. 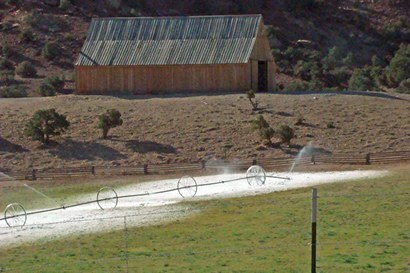 This is a 112-mile journey terminating at Red Canyon, just past Bryce Canyon. 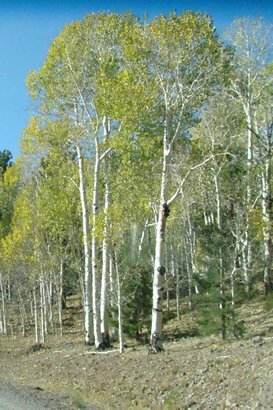 Stopping first for a “$5 FOOT LONG” sandwich, which cost SEVEN DOLLARS, we begin our trip through the Dixie Forest. At first we didn’t notice, but it became clear there was virtually no traffic on this most scenic highway. Just after passing signs to an Anasazi Museum we enter the town of Boulder. 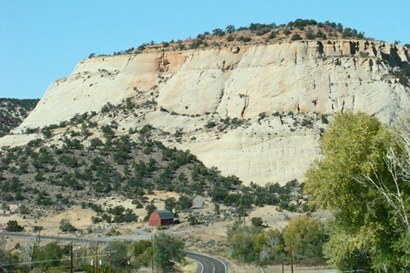 On the south side of town is Burr Grill that marks where Burr Trail from Capitol Reef joins our highway from about 60 miles to the east. 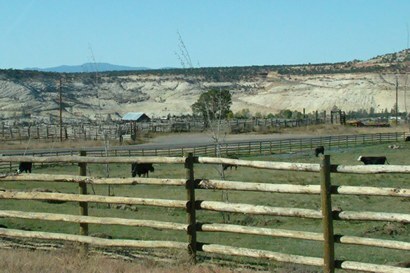 Next comes the main feature of Scenic Byway 12. 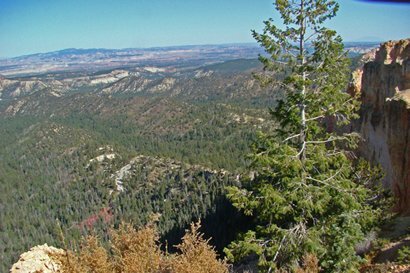 A stretch of road known as HOGBACK and it is a challenge for most people’s nerves. This is a ridge road with severe drop-offs on each side without guardrails. When we arrived here it was 37F at 6300-foot altitude. This narrow serpentine road without guardrails is not tolerant of driving errors. After crossing Hogback a highway sign says Steep Grade Next 4 Miles downhill at 14% incline. It doesn’t mention the 100% incline on both sides. 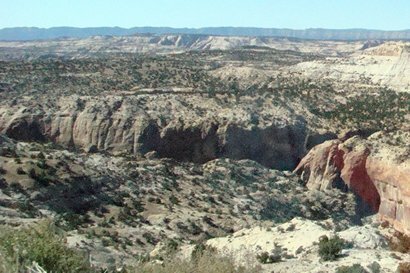 Reaching the Escalante River Bridge means you have completed this rapid downhill run, but the town is 14 more miles. There is an alternate even more excitingly dangerous road. 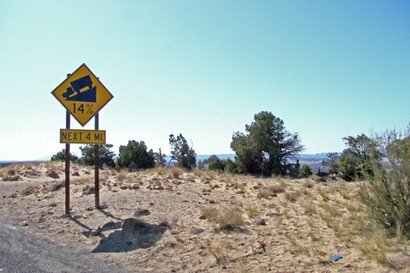 The riskier older road is called HELL’S BACKBONE ROAD. We did not take that “road less traveled”. 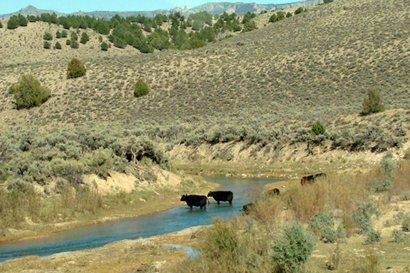 We ARE NOT among those folks who think a worthwhile drive is a sometimes one-lane road with unprotected 2000-foot drop-offs on each side. Measuring 39 miles on its trip from Boulder to Escalante it adds about 2 hours to this otherwise 24-mile trip. 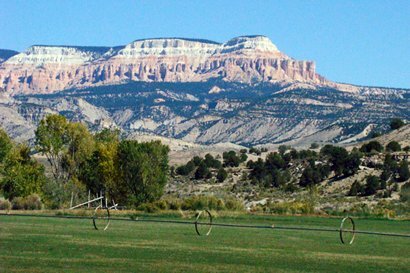 In Escalante we found the city park where we could eat our sandwiches and use restrooms. A carload of travelers also came in for relief while we were there. From Old Hickory, TN they had taken the HELL’S BACKBONE ROAD. The driver told me it was not such a scary drive. I noticed his three passengers were silent but their body language spoke volumes. It was obvious the view from behind the steering wheel looks different than from the passenger seats. They were headed to Vegas next (to continue gambling, I surmised). Down the road the next town is Henrieville, then Cannonville where there was a Visitor Information Center. 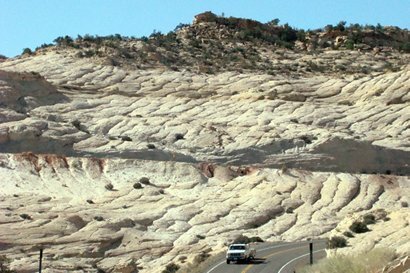 Later we found out that Kodachrome Basin State Park was only 8 miles SE of Cannonville, just a 15-minute drive. Manned by only one person and the waiting crowd, we left without asking our questions. Tropic is a small town filled with attractive motels and cafes. It was the final town before Bryce Canyon and probably a choice place to stay. 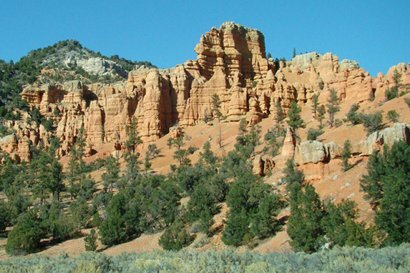 Now nearing Bryce Canyon I notice how the pink-orange color of these cliffs remind me of Circus Peanuts (a marshmallow candy.) 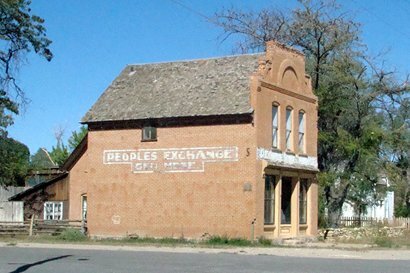 On Bryce Canyon road is Ruby’s Inn. This is a monstrous motel, shopping center, and post office. When we passed, it was alive with people. 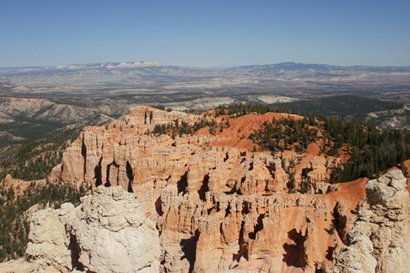 Entrance to Bryce and all national parks is now $25. That makes the Golden Age Passport I bought many years ago for $10 a real bargain since we get in free. 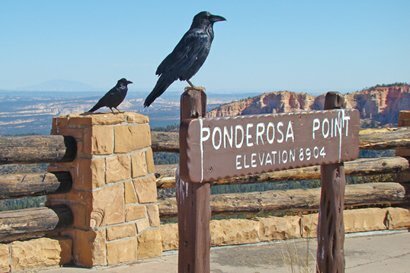 In Bryce at Ponderosa Point I noticed a couple of large black birds posing, one on the sign and the other sat nearby. I quickly shot a photo. Beggars they are - I’ve seen it at parks before. Almost immediately an old man tapped me on the shoulder and said, “Those crows have asked me to collect a dollar for each photo made of them”. I laughed and said those Ravens are just joking with you, they’re not crows. Foiled he laughed and returned to his car. 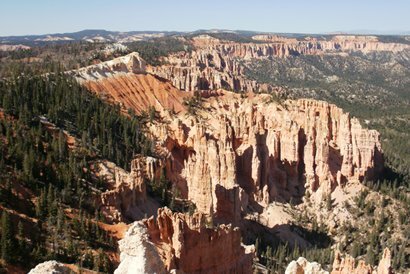 As the name implies – Bryce is a canyon. 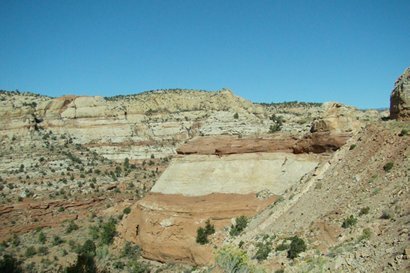 It has unique colors and formations, and offers many different locations as points of view. 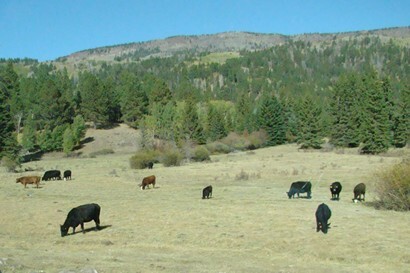 Once inside the park you can see it in any fashion you like, but we think it is best to drive the main road 19 miles to the south end. Then stop at your chosen points (now conveniently all on the right-hand side) as you leave northbound. It was here at 9100 feet altitude a fellow Texan noticed my San Marcos windbreaker and greeted me. We quickly decided it was too cold to do much else but shake hands and say HOWDY. 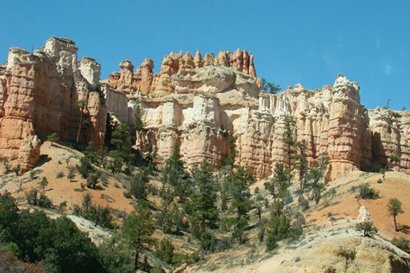 Back at SR12 exit Bryce by turning west immediately entering Red Canyon, a small but beautiful natural wonder. 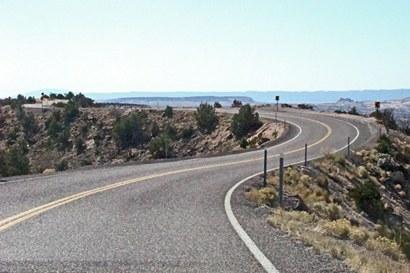 The highway crosses the Sevier River and then ends at a junction with Highway 89.